Yimiton's Blog: Police say Pistorius beat model girlfriend with a cricket bat before he shot her! Police say Pistorius beat model girlfriend with a cricket bat before he shot her! This story just keeps getting weirder by the day. According to Mailonline, Oscar Pistorius crushed his girlfriend’s skull with a cricket bat before shooting her dead, police have told her family. 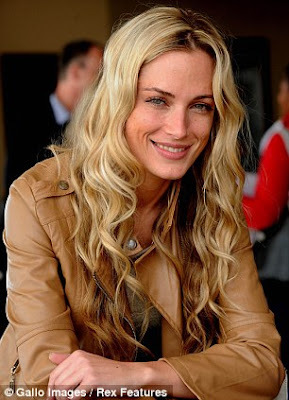 Details of the post-mortem examination of Reeva Steenkamp were withheld from last week’s bail application hearing. But grieving relatives who saw her body before Tuesday’s cremation in Port Elizabeth described horrific injuries from the cricket bat, and entry wounds from 9mm bullets fired by Pistorius. They were also briefed about the model’s death by police and lawyers from the state prosecutor’s office. In a sworn affidavit read to the bail hearing in Pretoria magistrates’ court last week, Pistorius claimed that he used the bat to break down the toilet door after the shooting, saying he had not realised his girlfriend was in the bathroom. Recall Pistorius claims that during the night he heard a noise in the bathroom and feared it was an intruder. He felt ‘vulnerable’ without his prosthetic legs, so he got a gun from under his bed and fired through the bathroom door, shouting at the ‘intruder’ to get out of the house and for Reeva to call the police. At that point Pistorius thought she was still in bed. Reeva Steenkamp's father, Barry Steenkamp, said Pistorius 'will have to live with his conscience' if he turns out to be lying about her death. Oscar Pistorius is currently walking free in South Africa. The prospect of being caged in prison has receded, at least for the moment since he has won bail. Let's see what happens in 4 months time when he reappears in court.